A terrorist take-out in Dubai attributed to the Mossad sparked an international furor, and a corresponding wave of support. Many T-shirts have been whipped up declaring support for the operation, but this one is unique in its irreverent approach.+This basic men's Israel T-shirt takes the kind of slogan found on souvenir T's from popular vacation spots and presents it as 'MOSSAD Dubai is for Lovers.' The text appears in a cheesy-on-purpose disco-style font on a background of cobalt blue bands. Next to the words is a picture of a pair of tennis rackets and ball, the kind of image that would appear on a T-shirt from a sun and sea resort. 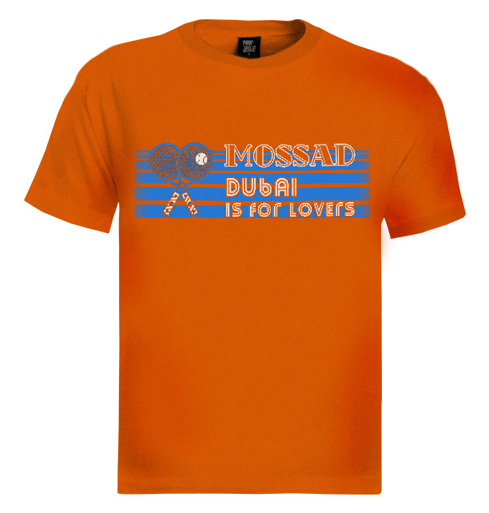 Show your support for Mossad!+This men's crewneck shirt is available in five colors: black, royal blue, red, orange, and green.+Fans of Israel will like this design, an example of the fun Israel-themed T-shirts that have long been popular souvenirs for visitors to Israel. Israeli-themed T-shirts make wonderful gifts for family members, friends, and colleagues. Our T-shirt designs cover all sorts of Israel-related trends, IDF T-shirts – a perennial favorite - and styles featuring Mossad, Israeli Special Forces, and Israel Air Force.+Our preshrunk Israel T-shirts are made from 100% ring spun cotton. Other fabrics might cost slightly less, but we use this cotton because of its high quality and particular softness. We are determined to use the best quality materials available to make our men's and women's T-shirts and guarantee 100% customer satisfaction with our product.+Please note that T-shirts made from 100% cotton may shrink up to a full size when laundered, even if they are preshrunk. Please follow proper washing procedure.